There are currently 115,056 users on this website. 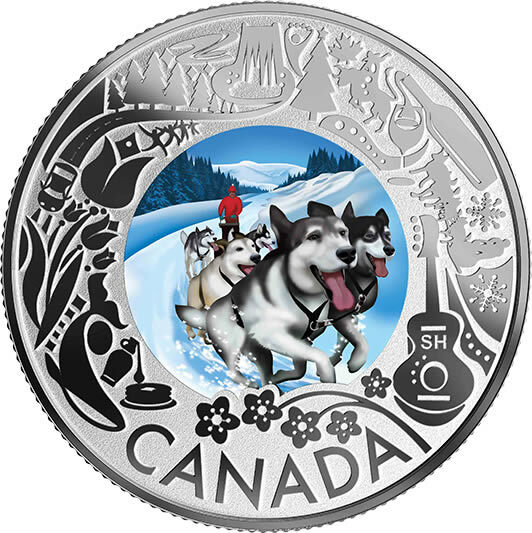 Royal Canadian Mint - The reverse image by artist Steve Hepburn features a colourful depiction of a team of sled dogs slicing through the powdery snow on a clear winter day. The adventure-themed image is framed by stylized icons that represent popular outdoor activities and sights in Canada: (clockwise from top) Niagara Falls; a Christmas tree; a rodeo; wine tasting; dogsledding; folk music; cherry blossoms; maple syrup tasting; whale watching; tulips; coastal drive; and the aurora borealis. The obverse features the year "2019" and face value "3 DOLLARS", and the framed effigy of Her Majesty Queen Elizabeth II by Susanna Blunt.